Paveletsky Railway Station. Alongside the tracks stands a small building, built solely for one steam locomotive. This is the legendary funeral train of Vladimir Lenin – a U-127 locomotive built in 1910. 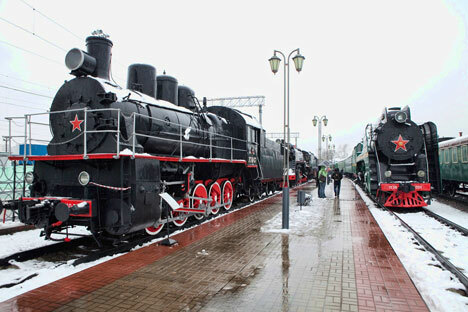 Originally, this steam engine operated on tracks in Central Asia, and after the Revolution it was relocated to Moscow. Railroad workers who serviced it grew ill and died of the Spanish Flu. For some while, the locomotive had stood at the depot, where vagrants began to live in it – the virus got them too. After that, people nicknamed it the “Black Widow.” Superstitious drivers feared to operate it. Overcoming “bourgeois prejudice,” young workers at the depot renovated the old steam engine in 1923, repainted it Communist red, and affixed a placard to it that read: “From those with no party, to the Communists.” Vladimir Lenin was elected as the train’s honorary Driver No. 1, and, just a year later, he was dead. The coffin with his body was brought to Moscow on board this U-127. Rumors ran that the steam engine was “cursed” and brought bad luck. But these stories are all in the past. Since 1937, the locomotive has held the status of a museum exhibit. During WWII, it was even evacuated from Moscow as an object of especial importance. At the end of the 20th century, a special pavilion was built to house it. The pavilion now houses the Museum of Moscow Railways. At its center is the “red locomotive” – a giant with five-foot wheels. The first railroads appeared in Russia in the19th century. At the time, the journey from St. Petersburg to Moscow (around 435 miles) took 21 hours by train. The rail route that linked the two cities had been built on the edict of Russian Emperor Nicholas I. The route has its own legend. Before the railway could be built, the countryside had to be surveyed. In order to speed up the process, the Czar simply took a map and drew a line between Moscow and St. Petersburg on it. “That’s how the rail line will go!” declared the Czar – whose forefinger overshot the line a bit, producing a straight line with a slight curve. Of course, this is just a legend. In reality, they built the line straight for economic considerations, and the curve appeared in it in order to skirt a ravine that would have been hard for locomotives to negotiate. In the 19th century, railroad employees wore uniforms with anchors on their buttons. This is because, in the early days, the railroads were under the control of the Ministry of Land and Marine Communications – hence the maritime anchor. It was only in the 1930s that the symbol was replaced by a more appropriate engineer’s wrench. “To get the loco going, you need to stoke the boiler with around two shovels of coal per minute (if running on empty).” Leonid Kruchavov has worked on the railways for more than a quarter of a century. He drives an ER-774-38 locomotive – the kind of engine which was hauling freight around the Soviet Union in the era following WWII. Long ago, this kind of locomotive pulled passenger trains between Moscow and St. Petersburg; today it pulls a retro train for tourists. The “ERka,” as the ER-774-38 is called, sets off from Paveletsky Station on a route along the Moscow Circular Railroad. The route itself has not shown up on the timetables of passenger trains for the past 80 years. The railroad was built in 1908, right through the center of Moscow; still, practically no Muscovites know anything about it. The 33-mile track was the first circular rail route in Russia, consisting of 14 stations and six bridges. The Circular Railroad links eight terminals and five industrial areas. The locomotive’s wheels clank past different warehouses and industrial buildings. From the window one can see the half-abandoned ‘Zil’ factory, which produced limousines in the Soviet era for Communist Party bosses. Behind the garages appears a small, two-level building – this is Kanatchikovo Station, just three miles from the Kremlin. Over the entrance a sign reads: “66.30 yards above sea level.” These signs once hung in front of every station, but this is now the last one left. In the station courtyard stands a black granite monument in memory of railroad workers who were killed during World War II. The Circular Railroad hauled heavy weaponry and tanks from the East of the country where munitions factories were located. If there were supply problems with coal, railroad workers even brought coal from home, to stoke the shunting engines. ERka enters a half-mile-long tunnel that is lined with platforms. It has reached the preserved Ploschad Gagarina (Gagarin Square) station - which is below Leninsky Prospekt (Lenin Avenue). The station at Gagarin Square was built in 2001, to link the Metro with the Circular Railroad and eventually run passenger trains on it. It has been promised that, by 2022, the Circular Railroad will be fully renovated and put in modern shape. In the meantime, the route is caught somewhere between the past and the present. The engine arrives at Rizhsky Station and gives the whistle a final toot. The last stop is the Museum of the History of Railway Technology. It is a museum in the open air, housed between the tracks that serve commuter trains and long-distance departures. There are over 70 exhibits – wagons from the time of Czar Nicholas II to modern high-speed trains. The oldest exhibit is nicknamed “The Sheep” – an Ov-series locomotive from 1903, bearing kerosene lamps and the Imperial crest. It was on a train like this one that Leon Trotsky, one of the main figures behind the Russia Revolution, rode around the country and urged troops to side with the Red Army. There is also a So-class locomotive here, of the kind deployed in the driest regions of Asia. These railcars did not allow steam to escape, which helped to economize when water was in short supply. The museum also has a locomotive named after the infamous commissar Felix Dzerzhinsky, creator of the gulag system. The powerful FD locomotive was designed by detainees of one of the first sharashkas – special industrial centers where arrested scientists were forced to work. “Iron Felix” was portrayed on postage stamps as a symbol of industrialization. Another cult exhibit at the museum is the P-36 locomotive engine from the 1950s. People used to call it “The General” – green with yellow stripes, like a golden braid. “It can hit speeds of up to 78 miles per hour. This type of loco used to haul trains like the Red Arrow, for example,” says Vladimir Vitvitsky. Now the old “General” looks on, as the high-speed trains of the 21st century hasten along the routes he once pioneered. Contacts for excursion are available in Russian here.